Our prostate cancer specialists offer unparalleled care and innovative minimally invasive surgical techniques. Every patient benefits from extensive expertise and our unwavering compassion and commitment to offering the very best treatment. At Lenox Hill Prostate Cancer Center, we believe that exceptional care begins the moment a patient walks into the office. Our warm, friendly staff is here to help you with every step of your prostate cancer treatment. When choosing robotic surgery, it is important to understand that the robot is only as effective as the surgeon at the controls. Our experts have extensive experience using the da Vinci Surgical System robot. Most robotic prostate removal surgeries last less than two hours. Procedure length can vary depending on the patient's unique prostate size, prostate cancer presentation and overall anatomy. Patients who choose traditional prostate surgery usually have catheters removed in two to three weeks. But with robotic prostate surgery, catheters are usually removed after one week. Our doctors will remove your catheter during a follow-up appointment and will use X-ray imaging to ensure proper urethra-bladder connection and healing. After surgery, your recovery takes place on the patient floor or, if you opt for an even greater level of comfort, at Lenox Hill Hospital’s 5 Wollman Executive Suites. * Satisfaction for patients staying in one of the 5 Wollman Executive Suites is at 99 percent, according to surveys gathered by Press Ganey. This specially designed unit provides an outstanding personalized experience for patients and their guests. The suites were developed with an attention to detail for exceptional comfort, convenience and privacy. With many views overlooking 77th Street and Park Avenue, the rooms have overnight guest accommodations and, in some instances, living space and a personal beverage area. The cornerstone of the unit is a concierge amenity service to provide for the individual preferences and special needs of patients. All deluxe, private and semiprivate hospital rooms in the unit have boutique, hotel-like features and amenities including flat-panel televisions and room-service gourmet meals prepared by a private chef. *5 Wollman Executive Suites fees are not covered by insurance. More than 90 percent of patients who undergo surgery at Lenox Hill Hospital return home by the second night, but some may require a longer recovery period. Some patients may feel well enough to return to work and regular activity in two to three weeks. Most other activities are comfortably resumed within four to six weeks. Erectile dysfunction (ED) symptoms and urinary incontinence after robotic prostate surgery is common and usually short term. Our entire staff remains dedicated and ready to help all patients and their families during the recovery process. Should you or someone you love need an expert in sexual or urinary function after surgery, we can help make referrals to a network of dedicated colleagues and specialists. The benefits of robotic surgery cannot be guaranteed as surgery is both patient and procedure specific. Previous surgical results do not guarantee future outcomes. Urinary incontinence after robotic prostate surgery is almost always short term. Patients who experienced normal continence prior to surgery generally regain urinary control within 12 to 13 months. Still, patients should expect some urinary control impairment that’s similar to the stress incontinence women experience after childbirth. This is the result of temporary disruption or damage to the sphincter muscles that control the release of urine. Patients can expect minor dripping or leaking of urine after the procedure, particularly during strenuous activity. This short-term incontinence after prostate cancer may also be triggered with a cough, sneeze or laugh. The time it takes a patient to resume sexual function after robotic prostate surgery varies based on the individual. Some ED symptoms are a normal part of recovery after prostate removal and should not be interpreted as permanent change. Most patients who experience normal sexual function before surgery—and were candidates for nerve-sparing techniques—regain sexual function within one year after robotic prostate surgery. Younger patients may experience faster or improved results. You may find the use of oral ED medications an easy step for help achieving and maintaining an erection. Our experts will help you explore prescriptions including Viagra (sildenafil citrate), Levitra (vardenafil) and Cialis (tadalafil). Most patients experience very positive results with these ED drugs, and they can help speed the return of natural erections. For some, ED medication may not be successful. It may take time for a patient’s nerves to regenerate to the point that ED medications become effective. 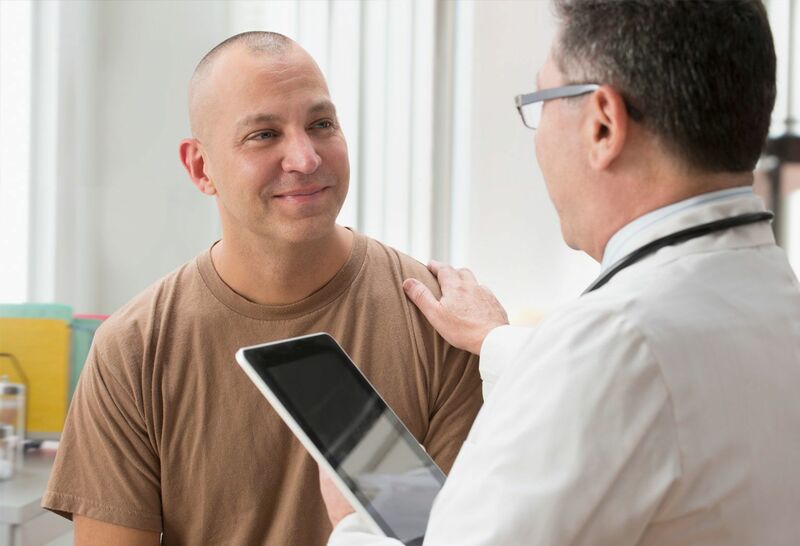 During this time, patients may consider penile injection therapy as a reliable option for achieving an erection. Certain patients may not regain erectile function after prostate removal surgery. We encourage these men to consider penile implant surgery. This permanent solution to ED delivers high satisfaction rates for both patients and their partners. Patients will no longer produce ejaculate once their prostate is removed. Most patients who experienced normal sexual function before surgery are still able to achieve and enjoy orgasms after robotic prostate surgery.